This page pulls together the main information for the Central section. Click on the appropriate tab to show that particular data. The map below shows the usual line in red with known variations in either blue or green. Those points on this page marked up as GeoLocations are marked on the map: summits - red marker; water sources - blue; other waypoints - yellow. Sections are marked by either light (semi-darkness) or dark (night) grey bars on the right-hand side according to your schedule. If a peak name has magnifying glass icon to its side then hovering over the name will show a popup with schedule details. You may edit the description by clicking on the text. Once in edit mode you can save your edits or restore the default description. Follow the path next to the fence, moving left to avoid a small crag at one point just after a bog bridged by some old fence posts. When the fence turns 90 degrees to the right, continue in the same line on the well defined path that keeps straight ahead past soft/boggy ground before bearing left to Calf Crag. A good path leads to the pass at top of Far Easedale. Straight on over the “crossroads” following the vague path that follows a line of old fence posts. The path keeps to the left of the beck, (good water source) at one point heading up a subsidiary gully well to the left. The posts stop around 200m short (GR289091) of Sergeant Man, straight on to this. Good path leads in almost a straight line (MB-325) over sometimes boggy ground to High Raise. An almost straight (MB-200 (approx)), well defined, path leads to Thunacar Knott. Good running terrain. When the main path bears left at the first rocky section, keep straight on to the cairn at the summit. Head straight towards an obvious small crag on the north side of Harrison Stickle. Pass this on the right then straight on to gain a broad gully from where an easy scramble gains the summit situated at the North end of the summit area. Return via the scramble and broad gully to gain a grassy area. Bear round to the left and drop steeply down to the top of Dungeon Gill where a series of stepping stones are encountered. 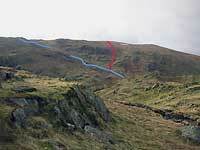 Follow the recently renovated path to the top of the stone shoot just before Pike o’ Stickle then take the first line leading up left to a small shoulder from where the summit is easily gained. Descend from the summit by the same route. Follow the wide footpath heading towards Langdale Combe (GR262084) at the top of Stake Pass. As you drop down onto Martcrag Moor a faint path can be seen to the left of the main track. This leads in a direct, but boggy, line to the top of the steep bit of Stake Pass. Cross the beck (good water) and then leftwards up to gain a diagonal shelf (several small cairns) that leads to the col (GR 255080) between Rossett Pike and Mansey Pike. Follow the ridge to the summit of Rossett Pike. Head (MB-260) to the top of Rossett Gill. On the Langdale face of Bowfell are two parallel, diagonal shelves, similar to the one just used to get to Rossett Pike. Go straight ahead over broken rocky ground to gain a spring near the bottom of the upper shelf. Follow this, keeping to the grassy bits, to its end and go straight across to gain the continuation of the lower shelf where a faint path may be found (small cairns). Eventually you emerge onto the summit plateau of Bowfell at (GR244069). Gain the summit of Bowfell. Follow the main track that heads towards Scafell Pike until it turns leftwards carry straight on to the summit of Great End. The summit is the nearer top according to Wainwright. Head back to the main track and follow this across very rough ground until a line may be taken to Ill Crag. Now head NW to Broad Crag then to Scafell Pike. Take care on the descent from Broad Crag. Take the track (MB-240) down to Mickledore. Down and left of the col is a narrow chimney in the rockface. This is the start to Broad Stand. Squeeze through the gap to a platform. Most will require the assurance of a line (Rock gear needed) for the first two rock steps. After this the going is easy over the smooth slabs leading up right with the best line aiming to the left - it is well worn by climbers. The summit lies around 400m away (MB-220). If you have decided that Broad Stand is not for you then take the path that drops left from the stretcher box on Mickledore to the lowest point of the East Buttress, skirt round to the south to gain the path leading to Foxes Tarn. The line that loses least height is about 100ft below the main rocks. From the tarn (a very small pool) a worn path with some repaired sections leads up the scree to the summit plateau. Turn left for the summit. Follow the steep path leading down the bowl (roughly MB-290, MB-247, then MB-310) eventually the angle eases and the edge of Rakehead Crag. Continue along the edge until a path on the true left of a grassy gully leads steeply down to gain the Wasdale-Eskdale “Corpse Road” near to Brackenclose (GR184070) and follow this to the campsite and NT carpark (GR183075). There is a scree gully (GR192067) to the east of Rakehead Crag. This is steep at first but soon eases and leads to steep grass before you can cross the beck by the intake wall at (GR186072). Take the path on the true right of the beck down to the car park. Note that the carpark is locked between the hours of 2000 & 0700. Either park on the roadside at Dunmail Raise or at the NT carpark (fee) at Brackenclose in Wasdale. An alternative is to park in Borrowdale near Rosthwaite. This is the most awkward section as the two end points are hard to get between by road and the section is very much an end-to-end affair. One possibility is to recce this in two stages to about halfway, doing both bits as out and back runs. GR-278072 This is at the head of Dungeon Gill. At your own risk!! GR-260081 Stake Gill at the point where it drops out of Langdale Combe. There is a beck with clear water on the approach to the ramps up Bowfell. I do not know how reliable it is in dry summers. About 200m further on the Scafell track from where you leave for Great End the path crosses a clear beck. This is the last reliable water on this section. About 200m SSW from Scafell Pike lies Broadcrag Tarn This is off-route but is fairly easy to get to. In very hot weather the water may be a bit stagnant. 16 Steel Fell 549 A prominent summit with the highest point close to a corner in the wire fence. 17 Calf Crag 531 A confusing summit area, especially in mist. The highest point is a rocky ridge with a small cairn, just to the West of the path leading to Helm Crag. 18 Sergeant Man 726 A rocky ridge rising from the surrounding moor marks the summit. Popular with walkers taking their lunch. 19 High Raise 760 The summit area is a large grassy dome interspersed with peat hags and pools. The summit is marked by an OS trig point and a large stone shelter. 20 Thunacar Knott 723 A wide summit plateau with many small rocky tors which can be confusing in mist. The summit is marked by a cairn. 21 Harrison Stickle 736 The summit area is a well defined rocky plateau with the highest point at the Northern end. 22 Pike O Stickle 709 One of the best defined summits in the district. A cairn marks the highest point though this is hardly without doubt. 23 Rossett Pike 651 The summit lies at the southern end of a long rocky ridge, overlooking Rossett Gill. It is marked by a small cairn. Note that there is another cairn to the East overlooking Langdale but this is lower. 24 Bowfell 902 A large and very rocky summit area with the top being a prominent rise at the Southern end. 25 Esk Pike 885 A rocky summit with the actual top being a cairn to the north of the path which lies in a curious cutting. 26 Great End 910 A broad stony plateau with two possible tops. Wainwright reckons the Eastern one to be higher, though there is little in it. 27 Ill Crag 931 A rocky ridge at the Southern end of a wide stony plateau marks the summit. 28 Broad crag 935 Perhaps the roughest summit in Lakeland. A large rock among equals marks the top. 29 Scafell Pike 978 The summit is defined by a large stone built platform. This is usually hidden by collapsed Three Peak Challengers. 30 Scafell 964 The highest point lies to the South of a broad saddle and consists of several stone shelters and cairns. Clicking on the "play" button below will cause the map to move over the route of the leg. The map moves in constant time though this may mean that on steep ascents the clock appears to speed up. The "+" & "-" buttons will speed up or slow down the speed at which the animation moves. The clock shows the current time according to your chosen schedule of and start time of . Note that the timings are only approximate.